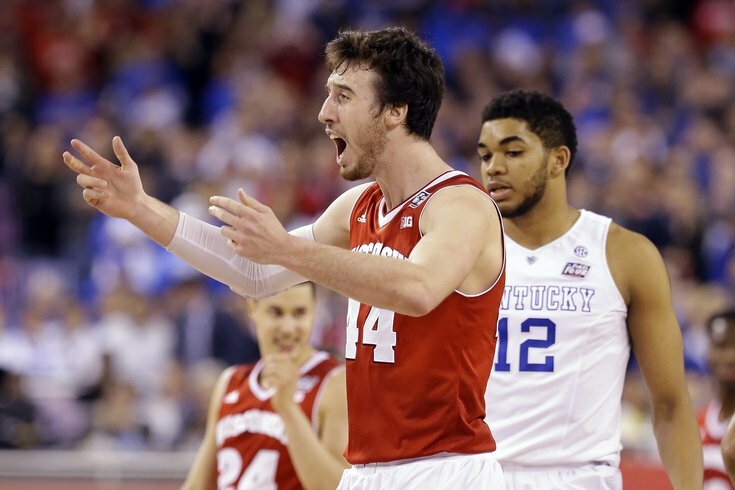 Wisconsin's Frank Kaminsky reacts during the second half of the NCAA Final Four tournament college basketball semifinal game against Kentucky Saturday, April 4, 2015, in Indianapolis. INDIANAPOLIS — Nobody ever said they were perfect. Now, the Kentucky Wildcats aren't undefeated, either. The hard-nosed Wisconsin Badgers did what nobody else could this season: They knocked off the Wildcats 71-64 on Saturday night behind 20 points and 11 rebounds from birthday boy Frank Kaminsky and a clutch comeback down the stretch. Now, instead of Kentucky going for history, it's Wisconsin heading to the final Monday night to play Duke. The Badgers, who lost 80-70 to Duke in a December meeting in Madison, opened as a one-point favorite. "I just feel like we wanted to win the national title, and we didn't do it," Wildcats freshman Tyler Ulis said. "So the season was a waste." Some of the Kentucky players skulked off without shaking their opponents' hands. The Wildcats close the season at 38-1 — two wins short of becoming the first undefeated team in college basketball since the 1975-76 Indiana Hoosiers. Instead, this NBA-ready group joins the star-studded 1991 UNLV team as the latest to take an undefeated record into the Final Four but lose in the semifinals. "I've had some tough losses and some unbelievable wins at the buzzer," coach John Calipari said. "My concern is that these guys keep it in perspective. They just had an historic year. If you want to blame anyone, blame me." Plenty of folks will take pleasure in that. Trending on Twitter shortly after the buzzer: "38-and-Done." And "38-and-1." All easy pickins for the many detractors of Calipari's group of "One and Done" players, All-Americans and other future first-rounders and lottery picks. But there's more than one program sending players to the NBA — more than one team that keeps on fighting even when things look bleak. Wisconsin had every reason to turtle, going without a point for six minutes during an 8-0 Kentucky run that put the Wildcats up by four and left the Badgers gasping for breath and resting their hands on their knees. Instead, they answered the Kentucky run with an 8-0 run of their own to set up the pullaway. It was a Kentucky-like effort, the kind the Wildcats pulled off yet again last week in a two-point win over Notre Dame in the regional final that made them look more gritty than invincible. "I think you guys have seen that all year," Wisconsin senior Sam Dekker said. "Whether we're down six or up 20, we're going to be us, and we're going to play our game." Dekker, a future NBAer himself, did most of the damage during Wisconsin's comeback and eventual pullaway. He started the run with bucket from the paint over Trey Lyles, then Nigel Hayes tied the game by tipping in an air ball after the clock had clearly turned to "0." No violation was called, and in a game full of shaky officiating that left both coaches screaming, it generated momentum for the Badgers and left Kentucky flat. Tied at 60, Andrew Harrison missed on Kentucky's next possession. Dekker followed by spotting up for a 3-pointer that gave Wisconsin the lead for good with 1:42 left, then drawing a charge call when Lyles slammed his shoulder into Dekker's chest. Another free throw made it 64-60 and Kentucky was in full comeback mode. Ahead 64-63 with 24 seconds left, Kaminsky, who was celebrating his 22nd birthday, hit two free throws. He and Bronson Koenig went 7 for 8 from the line over the last 24 seconds to seal the win. "Best birthday present I've ever had," Kaminsky said. Kentucky's last, best chance came while trailing by three with 12 seconds left. But Karl-Anthony Towns, who led the Wildcats with 16 points and nine rebounds, received the ball in the post and got fouled. He made only one free throw, and from there, Wisconsin iced it from the line. Some stats that made the difference: Wisconsin shot 47.9 percent from the floor — 13 points higher than what Kentucky allowed this season — and went 10 for 20 from 3-point range. The Badgers, ranked 262nd in the country in offensive rebounding this season, finished with 12 to only six for Kentucky. It helped explain how Kentucky could lose despite shooting 48 percent itself and committing only six turnovers. Junior Willie Cauley-Stein, a key to Kentucky's success this year, finished with two points and five rebounds. Calipari said the pressure of being perfect wasn't the difference in this one. "I think what impacted the game was the most was Wisconsin and how they play," he said. A bunch of Wildcats tugged at their jerseys and walked slowly off the court — losers for the first time this season, and the first time since last year's final against UConn. A few, like Towns, Cauley-Stein and Lyles, will be first-round picks if they leave college for the NBA's millions. They wanted a title, too. "We didn't care about the record," Towns said. "We just cared about the trophy that came with it."